From my old pieces (that I sold)...the Del Tins (entire swords or just blades) were marked Del Tin. There was an entire era spanning several years where Museum Replicas Limited swords having blades made by Del Tin had no markings on the blade. Often, these swords had hilts made by Windlass and assembled by MRL. 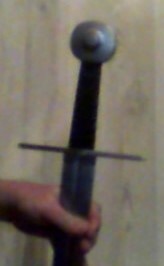 Back in the day, I purchased a sword that was clearly identified in the catalog as being of krupp steal made by Del Tin that arrived without blade markings. Can't help you on your sword, Mark. 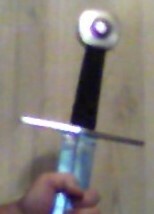 The photos are too small and blurry to identify the sword.